"Today we’re publishing the initial version of Opera 51. This build is based on the early version of Chromium 64, so it can be a little rough. Besides the new engine, there are visual and functional fixes, that make it a worthwhile update. It’s worth noting, that Opera 51 will now remember pinned tabs after restart, even if you select “Open the start page”, “Open a specific page, or set of pages” as your startup strategy. The private window on macOS was updated to match the Window’s design. In addition, on all platforms the static image has been replaced with a new animation. If you tend to open private windows a lot, you can use the “Do not show again” checkbox at the bottom of the page, to get rid of the animation and jump right to Speed Dial. - Fixed text color in converter as it was too dark. - Keep pinned tabs after restart no matter what startup strategy is selected. - Units converter recognizes dash symbol as a minus ex. −17.78 °C (wikipedia). - [Win] Couldn’t open news feed popup using badge in the address bar. - [Win10][HiDPI] Fix for shifted and badly scaled O-Menu after DPI change. - [Mac][Chromecast] Cast icon was always red. - [Mac][Chromecast] No cast favicon during tab casting. - [Mac] Reduce number of VTDecoderXPCService instances. - [Mac] Background tab title was too light in private window. - [Mac] Ad blocker counter color was wrong in private window." The Chromium has been updated to version 64.0.3251.0. Updated to 51.0.2776.0 (PGO) on Windows 10 and noticed that the LastPass extension has been "corrupted" twice now since the update. Repair seems to simply delete the extension requiring a trip to the extensions portal to reinstall it. Has anyone seen several random Speed Dial items added in this build? It happened a day or two after the upgrade, not at the time. Is there a setting to prevent this? In the fairly recent past, I've seen one added a couple times, but this is the first time I've seen this many. One other thing I've thought to mention: this build, along with several recent ones, eventually makes Google the default search even though I always set it to one of the others. @rseiler I just got one, what is kinda usual when updating to a new version. Also experiencing the same thing on Beta 50.0.2762.9 (PGO). The "recently closed tabs" function doesn't really reload the sites. @broliant Did you report it to the extension's authors? It has been a while since the extension was updated for the last time. @leocg When you asked this question I had not but in response to your question, I now have reported this to LastPass via submission of a support ticket on their website. I am not sure what their stance is on providing support for their extension when running in the Developer version of Opera - it may be they only get involved once the problem is seen in the main Opera browser - after all, as the browser build moves from Developer through Beta to main the issue may get resolved. But it is now reported so at least the opportunity for an investigation to begin has been provided. Hmm - might this be the version (51) that the sidebars are unified! Though what I understood from a dev post few months ago that the sidebars issue is perhaps a longer outreach. Video pop-out gives you the opportunity to browse the internet, while your favorite video plays in an adjustable window on top. Now, to give our users the possibility to go back to the original tab, we have added a “Back to tab” link, to return you to the source of the video. The button is found on the top of the popped out video. This has been a frequently requested feature, especially for those who use the Tab menu often. Going to it, you’ll find two collapsible lists for your Open Tabs, and Recently Closed tabs. This will declutter the right side of the browser, after opening the menu, while also making it easier for you to locate a particular tab. The Chromium has been updated to version 64.0.3260.2. They seem to have made some undesirable changes to the themes. In dark theme, text on the Bookmarks bar is black and thus difficult to read. Conversely, when I switch to the light theme the word Menu is still white and thus now hard to read - though perhaps it'll change after a restart? Follow up from LastPass below - as we might have anticipated they won't look into this until the same behaviour occurs in the main release rather than a developer or beta channel preview version. Thank you for reaching LastPass Support. We do not support Developer Editions of web browsers - such issue may be expected because LastPass is only detested (sic) with the regular edition during development. "detested"? Who wants to tell them that one? @sgunhouse haha.... lost it on that one. Today VPN is only available for Europe, nothing else work. 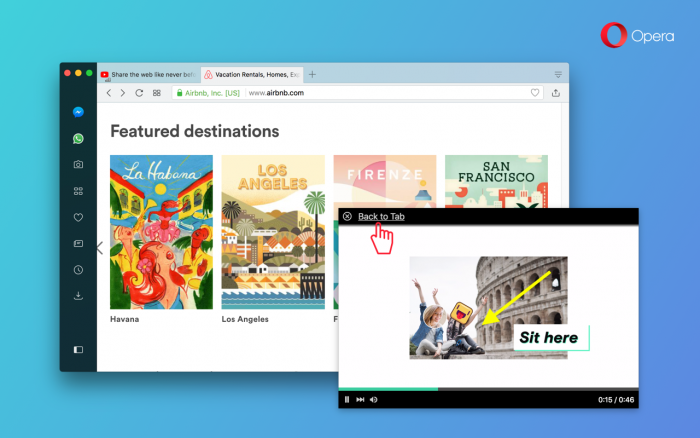 "We are announcing some changes related to a very popular feature found only in the Opera browser: VPN. Our VPN service will be migrating to our own data centers, and will receive a new way of providing you better, relevant search results when enabled. We have also reorganized our "About" page and have included a quick way to reset browser settings. Finally, we have a new mechanism for backing up and restoring preferences. Previously, the VPN service was hosted and operated by SurfEasy LLC. This company has recently been acquired by Symantec, and we have investigated the best options for hosting the service and concluded the browser VPN service will be moved to our own data centers. Opera’s current server infrastructure, one of the highest capacity super-computer clusters in the world, is already hosting services such as the compressing engine for Opera Mini. The colocation of the browser VPN service to our data centers is expected to give increased performance, scalability, and balancing capabilities, while keeping it a free, and no-log service. As we move the service to the Opera data centers, we are also changing from listing locations based on countries to regions. 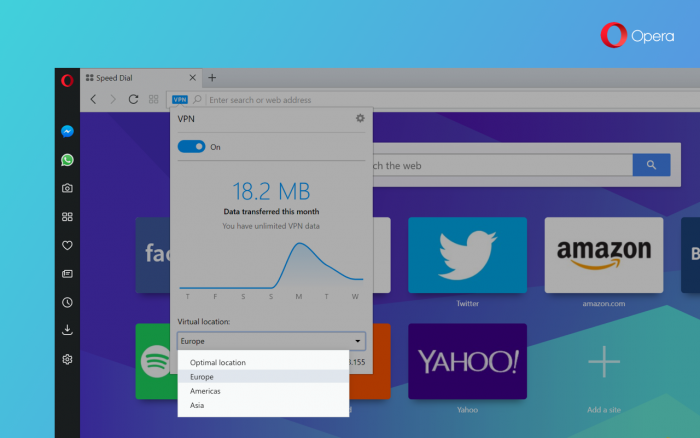 For the updated browser VPN, we will provide these options: Optimal location (default), the Americas, Europe, and Asia. Locations will be rolled out gradually, starting with Europe today, and the Americas, and Asia coming soon. As the usage of the free browser VPN service keeps growing, we have also noticed people complaining about the quality of search results, when having the VPN service enabled. When massive traffic goes through certain IP ranges, search engines tend to classify it to a certain area. As a result, you might get all your search results for example in Ukrainian or Dutch, and languages can again change unexpectedly. 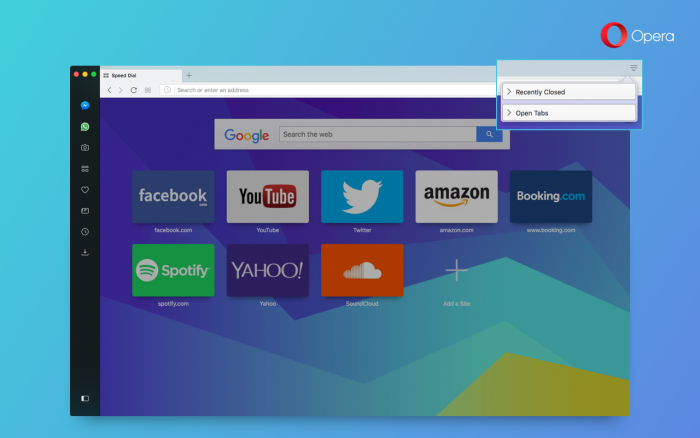 By default, Opera will now bypass the browser VPN, when you use your native search engines, such as Google, Bing, and Yandex. These connections will still be secure over Secure Sockets Layer (SSL), but your local IP will be made visible to the search engines. When you click on links to navigate away from the search engines, the service will automatically be re-enabled. We believe it’s a smart balance between absolute privacy, and user comfort. People can also browse with the “local search” feature turned off by simply using a private browsing window. 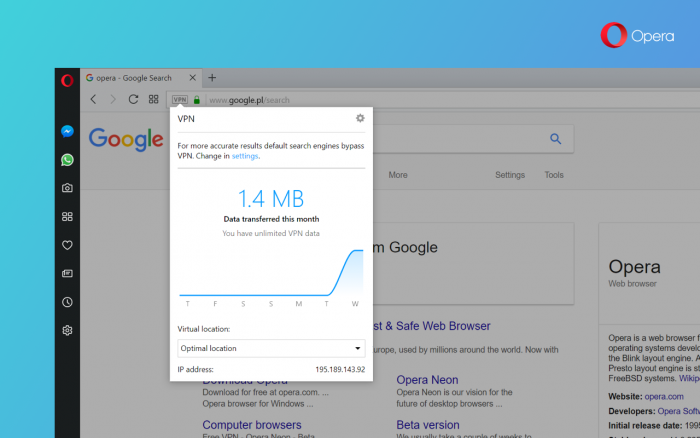 Then, the browser VPN connection will be enforced for any website, including your search engines. The "About page" is one of the internal pages that we often go to, as it serves useful information on hand, and also allows you to upgrade your browser easily. The page got a closer look and is better organized now. Each of the sections gets a heading for better readability. Additional links for legal information have been added, as well. In today’s update you will find the option to quickly reset the browser to its factory settings. Clicking the “Reset browser settings…” button, will revert any custom search engines to the default, remove pinned tabs, disable extensions, and will clear temporary data, such as cookies. However, your bookmarks, history, and saved passwords will remain in place. You can reset your browser settings in Settings (Preferences on macOS) > Browser, then find the “Reset browser settings…” button. Previously, users had to delete and re-install Opera, to reset all browser settings after saving their preferences in a separate place. We now have a mechanism for backing up and restoring working profile preferences, to help avoid the unintentional alterations of these settings. Whenever profile settings have been read successfully, we create a backup of the files involved. When the files exist, but cannot be parsed, we use the backed up files instead. This means, that Opera should still be usable, after external applications or users, that like the manual editing of JSON files, have possibly made incorrect changes to Opera’s settings files." The Chromium has been updated to version 64.0.3269.3. - You might have problems with connection to Chromecast. We’re working on the solution. - If you have the chromium-ffmpeg-codecs-extra installed on your Linux machine, websites with embedded videos might crash their tabs. Run Opera with the command-line option --ffmpeg-preload-mode=disabled to workaround the issue. - VR got over hacked, and it’s temporarily unavailable. We are sorry for this. It will return in no time.